When you exercise, MCT oil can help boost fat-burning and cut down on the need for carbohydrates for energy. For anyone looking to lose weight or boost their energy, MCT (medium-chain triglyceride) oil is an ideal supplement for smoothies, salad dressings, and even a cup of coffee. That's because the medium-length chains of fats that the oil contains are easily digestible, provide an instant source of energy, and help you feel full to prevent overeating. But if you want the full health benefits of MCT oil, you have to choose the right one. That means deciding whether you prefer a palm- or coconut-derived formula, what size bottle you need, and what other features will make the oil the best fit for your diet. Overwhelmed by all the options? Our shopping guide can help you select the best MCT oil for you. We offer a few specific product recommendations to make it even easier to find the perfect oil. MCT oil can be derived from both palm oil and coconut oil. Nearly 50% of the fat found in palm oil comes from MCTs, while nearly 60% of the fat found in coconut oil comes from MCTs. Some formulas contain either palm- or coconut-derived MCTs, while other formulas contain a blend of the two types. While both offer effective health benefits, it's best to stick to coconut-based MCT oils because they're usually sustainably sourced. Unlike pure coconut oil, MCT oil remains a liquid at room temperature. Most bottles are available in 16- or 32-ounce sizes, which will last a good while because a serving size is typically only one to tablespoons. If you're traveling, though, you can also find MCT oil in individual serving size packets, which are easy to toss in a bag or lunchbox. As with any organic food, purchasing MCT oil that's certified as organic means the coconuts and palm kernels were grown without pesticides, fungicides, and herbicides. These oils tend to have a higher nutritional content and keep unnecessary toxins out of your diet. Most MCT oils are sold in plastic bottles. Opt for formulas in bottles made of BPA-free plastic, though, to keep harmful chemicals out of the oil. It's also important to choose an oil that comes in an opaque bottle to prevent it from degrading when exposed to light. Bottles with a squirt-cap are usually best because they allow greater control over the amount of oil you dispense when you add it to your favorite recipes. While MCT oil is flavorless on its own, some manufacturers add flavoring to make it a better mix-in for smoothies and coffee. Vanilla, chocolate, mocha, and caramel are some popular flavor options to consider. Most 32-ounce bottles of basic MCT oil cost between $19 and $24. Organic formulas are usually slightly more expensive, ranging from $24 to $27. If you want the purest organic MCT oil that's made from sustainably-grown coconuts or palm kernels, you'll usually pay between $28 and $48. Q. Can I ingest MCT oil straight? A. While most people prefer to mix MCT oil into a smoothie or use it as a creamer in their coffee, you can take it straight. Just take one or two tablespoons of the oil directly from the spoon if you prefer. Q. What other health benefits does MCT oil have besides aiding in weight loss and boosting energy? A. 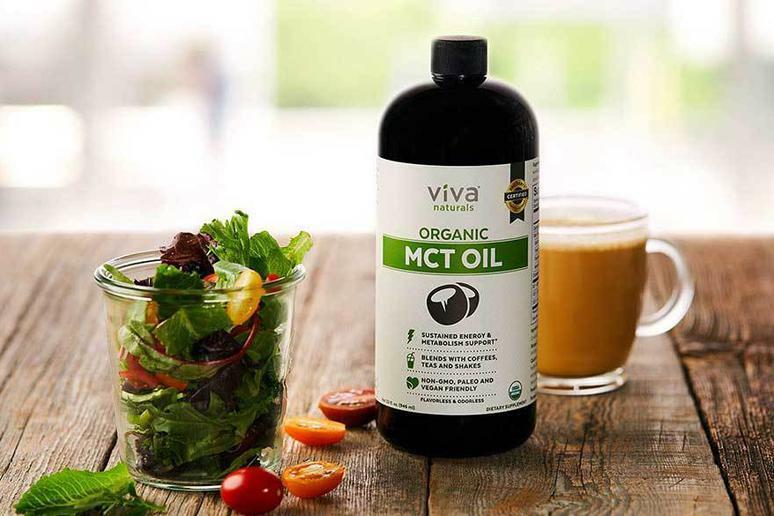 Some studies suggest that MCT oil can help improve cholesterol levels, lower blood sugar levels, and aid brain function in individuals with Alzheimer's disease. It can also help treat other conditions such as epilepsy, malnutrition, and malabsorption disorders. Our take: A truly tasteless, odorless oil that's ideal for anyone who's on a keto diet or looking to boost their energy and brain function. What we like: Boosts mental focus and controls appetite. Doesn't leave behind any oily residue, so it mixes easily into food and beverages. Doesn't produce a jittery feeling despite the increased energy. What we dislike: Can upset the stomach, so it is recommended to incorporate into your diet slowly. Our take: A high-quality oil that can help encourage weight loss and increase energy for less than $20. What we like: Consistent use can help improve your digestive health. Mixes well with even cold liquids and is available in several tasty flavors. Bottle is sturdy and leakproof. What we dislike: Doesn't have an easy-pour top and can be difficult to control how much oil comes out of the bottle. Our take: A certified non-GMO oil that mixes well with nearly any beverage so it's nearly undetectable. What we like: Doesn't have a noticeable flavor or odor and blends easily into nearly any recipe. Extremely effective in helping keto dieters reach ketosis. Can also be applied to the skin. What we dislike: Some users find it difficult to control how much oil comes out through the squirt top.